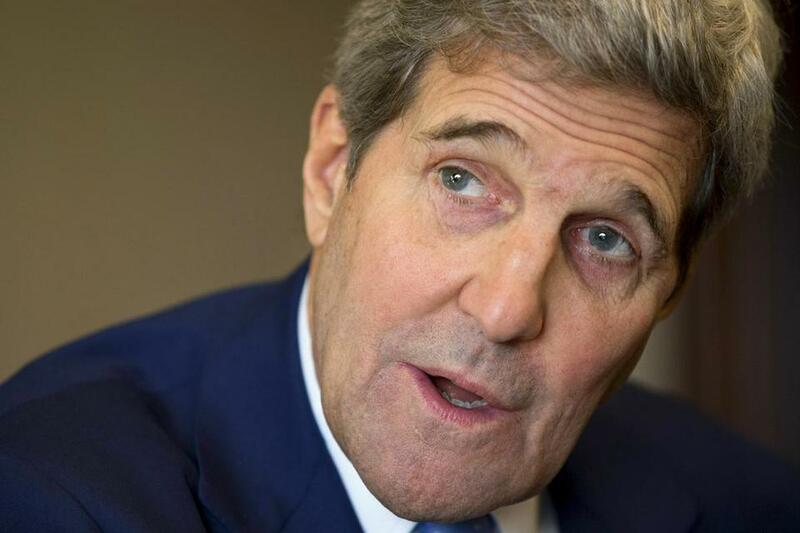 Secretary of State John Kerry sent a letter to governors on refugees. WASHINGTON — Secretary of State John Kerry, seeking to allay fears from the Paris terror attacks and muffle the outcry over a plan to accept 10,000 Syrian refugees in the next year, has sent a lengthy letter to Governor Charlie Baker of Massachusetts and his counterparts detailing the tough screening procedures for the immigrants. The 4½-page letter details the type of refugees who receive priority — families, victims of torture, and children — and describes the multiple screening steps refugees must pass. The letter, also signed by Jeh Charles Johnson, secretary of Homeland Security, was sent to all governors Friday in response to more than two dozen governors including Baker who said they would not accept Syrian refugees in their states at this time. It was provided to the Globe on Monday. A rising backlash against Syrian refugees has been reflected in Congress, in rhetoric from GOP presidential candidates, and in public opinion polls after reports that one of the terrorists in the Paris attacks that killed 130 crossed into Europe alongside Syrians fleeing terror in their country. Kerry is seeking to allay fears from the Paris terror attacks and muffle the outcry over a plan to accept 10,000 Syrian refugees in the next year. Dozens of House Democrats joined their Republican colleagues last week in passing a bill to tighten the security screening for Syrian refugees. The White House has deemed the measure unnecessary given existing protocols. Kerry and Johnson said in their letter that Canada has pledged to accept 25,000 Syrian refugees this year. Even as France reels from the attacks, President Francois Hollande reiterated his country’s commitment to accepting more Syrian refugees, the letter said. Only a “very small proportion” of the refugees the United States accepts are unaccompanied adult males — usually survivors of torture, LGBT individuals, or those with disabilities, according to the letter. “Under the current system, if there is any doubt about whether an applicant would pose a security risk, that individual will not be admitted to the United States as a refugee,” Kerry and Johnson wrote. Since October 2011, the United States has admitted 2,159 Syrian refugees into the country, according to the State Department, including 72 in Massachusetts. Candidates are first interviewed by the UN High Commissioner for Refugees to determine their eligibility for refugee status — whether individuals have been persecuted based on political opinion, social group, race, religion, or nationality. The State Department then takes over the process, through contracted resettlement support centers that conduct further interviews. The State Department performs background checks using a variety of terror, law enforcement, and intelligence databases. The US Citizen and Immigration Services and the Department of Homeland Security conduct further reviews and interviews. The process includes vetting biometric information, such as fingerprints, for those between the ages of 14 and 79. US Customs and Border Protection conducts more checks. Finally, the State Department and the Department of Health and Human Services determine the appropriate city where a refugee will be resettled. “We have tremendous faith in this system’s ability to detect, investigate, and disrupt terrorist plotting in this country, as it has done repeatedly,” Kerry and Johnson wrote. Baker’s office did not respond specifically to a request from the Globe for comment on whether the letter alleviated his concerns about Syrian refugees. “Governor Baker recognizes the obligation Massachusetts has in providing care for refugees resettled in the Commonwealth and is working to ensure the public’s safety in the wake of the recent, terrible tragedies despite the limited role that states play,’’ said Lizzy Guyton, Baker’s press secretary. Baker said he continues to have questions about how the agencies vet refugees and said he hopes to have conversations this week about that process, according to the Associated Press. A White House official said Monday the Obama administration has been in “regular contact” with Baker. The governor’s fears are echoed by the Center for Immigration Studies, a Washington-based research group. Jessica Vaughan, director of policy studies at the center, said that while the steps Kerry and Johnson outlined are a “good plan,” they do not allay concerns expressed by FBI Director James Comey that there are no government officials in Syria whom the agencies can use to help in the vetting process. The backgrounds of Syrian refugees are difficult to confirm because the United States does not have personnel in the country verifying applicants’ claims, Comey said in congressional testimony last month. “I can’t sit here and offer anybody an absolute assurance that there’s no risk associated with this,” Comey said. “There are lots of false documents available to people to create a new identity,” she said.